Firstly I would like to introduce myself. My name is Colin Kelly and I am the Secretary of The Diesel Electric Rail Motor Preservation Association of Victoria Inc. (DERMPAV). We are in essence a rail preservation group dedicated to the restoration of Diesel Electric Rail Motors. Yes! I am sure you are all wondering what that has to do with a bus forum! Well! Our organisation, largely through the efforts of our treasurer at the time which was about twenty years ago acquired an AEC Regal Mark III, 41 seat, side cab bus. No.531 from the government. Of recent times, I have read the posts on this and other web sites about AEC 531, as we call the bus in our organisation. There has been a general lack of feedback to the questions posed and a lot of guess work about its existence. So, since AEC 531 has now come back under our organisations care I have decided to, through this forum to be its voice, keeping you all informed on the goings on surrounding AEC 531. I am doing this as the normal lines of communication and networking that would exist if we were a bus organisation will not be present so I am hoping to fill that void through this forum. If you are interested, you may visit our website at www.dermpav.net.au but currently there is nothing listed there on AEC 531. It will however provide a general overview of DERMPAV. We are not a bus organisation and therefore have no history of AEC 531 prior to it coming to us. So I will ask all the readers if they could assist us with any history information or photos they may have on AEC 531 when it was in regular service with the MMTB, if this could be passed on it would be much appreciated. So with the above in mind I will take you on a potted journey as best as I know it, from when we acquired AEC 531 to the present day and our future intended use for AEC 531. Our then Treasurer had decided that while he was interested in Diesel Electric Rail Motors he did not like travelling to our depot to participate in the restoration activities, and announced at a meeting that he had placed a submission on our letterhead paper before the government for an AEC Bus so he had a slice of transport history to look after. At the time our executive committee were not sure he would be successful with the submission. But talk within DERMPAV then, was that it could be used in conjunction with our Diesel Electric Rail Motor to provide a more interesting heritage tour. As is documented elsewhere our Treasurer was successful and AEC 531 was delivered to his property near Woodend. He informed DERMPAV that he had the bus and he would be looking after it, maintaining it, keeping it garaged at his property. At the time DERMPAV could not have hoped to house it securely. In allocating the bus the government placed conditions, our organisation was responsible for the maintenance of the asset and it had to be housed securely and displayed to the people of Victoria. On all accounts our Treasurer fulfilled these requirements, although maybe very loosely. But in any case it started DERMPAV’s association with AEC 531. It was now in this period which would span about twenty years that most of the questions and guesswork has been posted by interested readers that would either spot AEC 531 when it was out and about, or were trying to locate it during this time. During this period our now former Treasurers personal situation changed and he moved to a property near Elmore. While arranging for the bus to receive some maintenance by a mechanic in Elmore the engines injector pump and governor was unbolted by person or persons unknown and stolen. Now we are in the year 2011, and AEC 531 was inoperable and languished in a vacant lot in the township of Elmore. Our former treasurer did try hard to obtain a replacement injector pump to get AEC 531 operable again but was not successful. 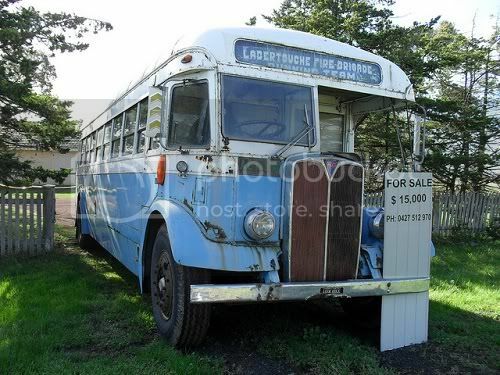 It was at this time that a price of $12,999.00 was placed in the passenger window of the bus this caused some concern with those that understood AEC 531 was part of the bus heritage fleet and brought AEC 531 back into mainstream attention. Numerous photos were posted with this sign in the window, later this would be replaced by a sold sign, but that was placed there by the mechanic to stop people coming in to his business asking about the disposition of the bus. DERMPAV operated its Christmas break up on the 10th December 2011 and as is normal practice all members are invited, and it was here that our former treasurer informed me that he was no longer interested in maintaining or housing AEC 531. As of that night he was handing AEC 531’s responsibility back to DERMPAV he also explained its current situation. I knew the situation DERMPAV had just been placed in and luckily the next day was our Executive Committee meeting so the matter could be discussed and a solution to AEC 531’s future established. But twenty years later DERMPAV was a much more matured organisation it had moved its home from Spotswood to Newport and DERMPAV could now hold AEC 531 securely. Now, AEC 531 was viewed a lot differently, the tours branch were consulted and stated they could think of a number of tours that AEC 531 could be operated on, like our Diesel Electric Rail Motors, AEC 531 would be operated 12 times per year. Most of the tours involved operating in conjunction with the DERMPAV rail motor, but some stand-alone tours were also envisaged. In the end it was decided we should investigate the overall condition of AEC 531 and make a final decision at our February meeting. I visited AEC 531 at Elmore on the 29th December 2011 and took a number of photos of the bus to show them to the members at the February meeting, as none of the members had set eyes on the bus since its allocation. 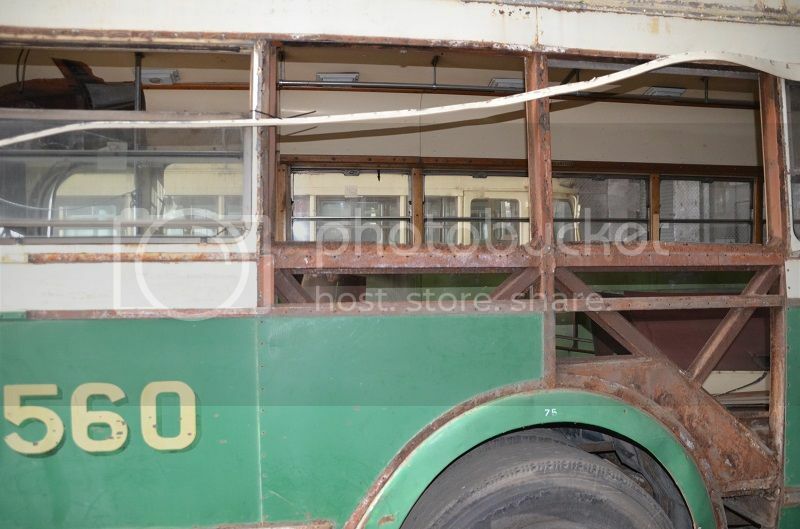 The buses general condition was not too bad, it showed signs of neglect and had not been maintained as well as it could have, the coachwork did show signs of rust and neglect all the window rubbers had perished but for its twenty years it was in reasonably good condition. At the next meeting I put up a slide show of AEC 531 at Elmore, by this time some of the members of DERMPAV had gone into overdrive and there was plenty of positive thoughts about AEC 531 to the extent that a decision was reached to retain AEC 531 and establish a restoration plan that will see AEC 531 returned to active heritage tour service with DERMPAV. So with that decision made, it brought forward a couple of other problems, as I have already stated we are not a bus organisation, so no-one in our organisation was familiar with the maintenance procedures or the operation of AEC 531 on the Vic Roads Network, this was especially compounded by the fact that it is fitted with a preselector gearbox that requires special driving techniques. So not wanting it to languish in Elmore any longer than was absolutely necessary, our best option was to obtain the services of a person or persons with some experience in this type of bus. Here I would like to acknowledge the help provided by the Bus and Coach Society of Victoria who freely provided us with contacts and an endless amount of help and assistance. Through this process we were fortunate to be introduced to two gentlemen David Oaten and John Phillips who are still actively operating and maintaining a Regal Mark III bus. Both of these people have provided a yeoman amount of advice and assistance and offered their services during the recovery operation of AEC 531 from Elmore to our depot at Newport. DERMPAV’s preference was to operate AEC 531 under its own power rather than have it towed or floated, so we set out and were successful in acquiring a replacement injector pump and governor. So now the day was set to recover AEC 531. The 10th March fitted in with everyone so when that arrived myself and another member travelled to Elmore and started with the many tasks that lay before us prior to AEC 531 moving under its own power on the Vic Roads Net work. We poured water into the radiator to find it running out of a corroded alloy engine plate faster than we were putting it in, to remedy this an new plate was manufactured and re-bolted to the engine then the engine was successfully filled with water. All the windows were cleaned, tyre black applied to the tyres to spruce the bus up a bit. The spiders that had called AEC 531 home since October 2011 were evacuated from the drivers cab. John Phillips with David Oaten and his son Matthew arrived. They fitted and timed the injector pump, checked and adjusted the gear box brake bands, 3rd gear had worn considerably and was essentially inoperative, this was from the change speed pedal being used in the same fashion as a clutch pedal. So with all the adjustments and corrections made the Engine on AEC 531 fired into life. After air was pumped up both John and David carried out a myriad of other checks and then declared the bus fit to move to Newport. 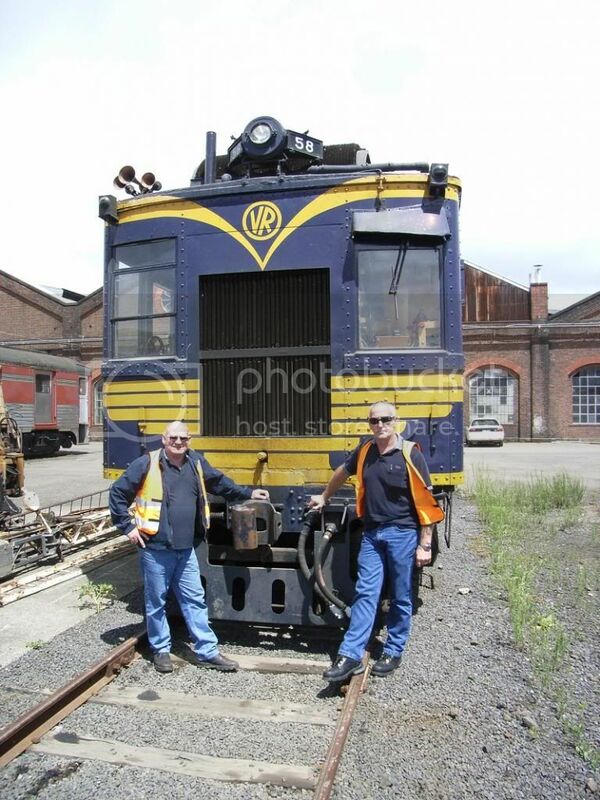 So at 1:01 pm John Phillips moved AEC 531 again, under its own power, a running brake test was conducted to ensure the air brake was operable, once confirmed AEC 531 left the vacant lot at Elmore, joining Margret Street and into the car park next to the Elmore miniature railway, where a group photo was taken of those involved by Matthew Oaten. At 13:10 we all departed Elmore down the highway for Bendigo where the bus was to be refuelled. Our arrival at Bendigo caused a lot of interested points and stares from bystanders. We were even pulled over by the highway patrol who after carrying out a breathe test seemed to know more about the bus than we did. When we arrived at the petrol station and were refuelling AEC 531 a lady in another car asked about the buses history and stated that it was a blast from the past as she had commuted on these busses when she was living in Melbourne, and was glad that this one was going into preservation. We departed Bendigo moving down the freeway. It takes a long while to get to Melbourne at 65 k.p.h. but we eventually arrived at Newport at 6:50 pm in the evening, placing AEC 531 into the DERMPAV compound and shut the engine down. To support this post, I will post three photos. 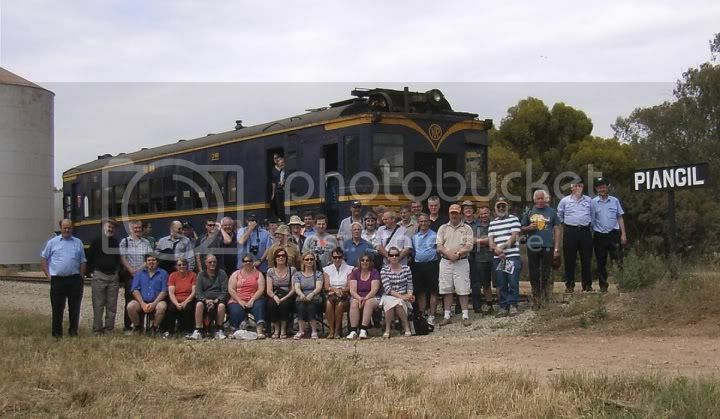 The first is of our Diesel Electric Rail Motor with all the tour participants at Piangil during a recent tour, (we like rail motors), the other is of the group at Elmore that recovered the bus with AEC 531. The other is of AEC 531 progressing to Bendigo. On behalf of the Executive Committee of DERMPAV I would like to extend our sincerest thanks to all those that have helped with the recovery or future restoration of AEC 531. I especially need to mention John Philips who owns AEC 592, and David Oaten who assisted on the day and the events leading up to the day of recovery. To Matthew Oaten for his assistance on the day with various tasks and items to prepare AEC 531. To Malcolm Morgan of the Sydney Bus & Truck museum for locating a replacement injector pump to enable AEC 531 to be made operational again. To Paul Kennely, Secretary of the Bus and Coach Society of Victoria and to Gary Davey and Tony Carson for assistance with parts and information. Although we are only newbies to bus preservation, I feel that with all the support that was freely offered, AEC 531 will have a vibrant future within the heritage sector for many years to come and will continue to provide a heritage transport link to the way we once commuted around Melbourne. So stay tuned and as they say.......Watch this space for the restoration photos of AEC 531. If you have any questions or would like to offer support please offer them through this forum, it might take a little time but I will try and answer them to the best of our ability. Sorry this post is so long, and thanks for taking the time to read this. Great news Colin. I am glad, and relieved, that it has all worked out. There were 135 AEC Regal Mark IIIs delivered to the MMTB from January 1951 to December 1953. Sixty five had Comeng bodies, one was bodied by Ansair and the remaining 69 were bodied by Martin & King. Number 531 was the first bodied by Martin & King and was new to service in March 1953. Here I am back again to post the second installation on AEC 531, firstly I would like to thank System Improver for his supportive comments posted on this post also to all the readers who have followed this post to date. Your support is very much appreciated. After the arrival of AEC 531 at our depot we completed a preliminary restoration inspection on the bus. As a result of this inspection DERMPAV decided to obtain another Regal Mark III bus to use as a donor vehicle, enabling parts and panels off the donor bus to be used in AEC 531’s restoration. Then, in the end, remove and store the major components like the engine, radiator, gearbox, diff, rear axle, tyres and wheels etc, as a source of spare parts to keep AEC 531 on the road in active DERMPAV heritage service. So with this requirement in mind we had been scouting around, looking at various Regal Mark III buses that were still in existence or up for sale, our preference was for a Regal Mark III bus with a Martin and King Body. This was essentially MMTB buses 531 to 599. 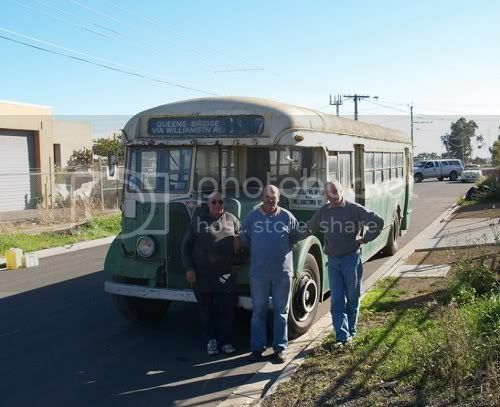 We made contact with most of the current owners that have old MMTB AEC Regal Mark III buses. This quest, lead us to AEC 593, it is a Regal Mark III bus that had been converted to a motor home and we very nearly purchased this bus. One of our members even carried out an inspection of it, here is a photo of the old girl for your viewing pleasure. However at the time an agreeable price could not be negotiated so our search continued. Here is AEC 593 which was located on the Melton to Kelior Road, this bus was recently sold on Ebay but failed to reach the reserve price. Its current disposition is unknown. Whilst having discussions with the owner of AEC 560, we explained that DERMPAV had acquired AEC 531 and how it intended to restore this bus and keep it in heritage service. These discussions were very fruitful and the owner explained that he had the same idea and had obtained a two door Regal Mark III bus AEC 560 and another unknown Regal Mark III bus that had been used as a motor home. He had scrapped the motor home bus and stored all the parts. These were offered to us at an agreeable price. I went over and viewed the parts, during this time I was shown AEC 560, after in depth discussions the owner offered us the opportunity to purchase this bus. I carried out an inspection and could see that the interior was in overall better shape than AEC 531, the body was comparable although one of the passenger saloon windows was broken. With the decision to purchase another bus for the intention stated above I decided that AEC 560 would be a suitable purchase and accepted this generous offer. So with financial arrangements concluded DERMPAV became the owners of AEC 560 and a huge stock of spare parts which included an engine, gearbox, front and rear axle assemblies, tyres and wheel assemblies and a huge amount of internal fittings including a steering column and gear selector assembly, etc. So now DERMPAV are the owners of AEC 560 and the custodians of AEC 531. So with the acquisition of a huge stock of spare parts and another complete 41 seat bus DERMPAV’s thought process into bus restoration and future bus heritage operations changed somewhat. It is now DERMPAV’s intention to see the two buses restored with one being able to act as a spare in the event the other breaks down. The huge store of spare parts will be able to be used on either bus to keep them on the road. AEC 560 was purchased by Colin Hurst in the late 1970’s from the Melbourne and Metropolitan Tramways Board and was used by him until he passed away. The bus was transferred and then on sold to the previous owner at Dee Decker Tours where it went into storage until we purchased it. AEC 560 was moved under its own power to the DERMPAV depot on the 28th April 2012, it operated over the Vic Roads Network on an unregistered vehicle permit. We were fortunate enough to be able to again call on John Phillip’s services to bring AEC 560 home to our depot. 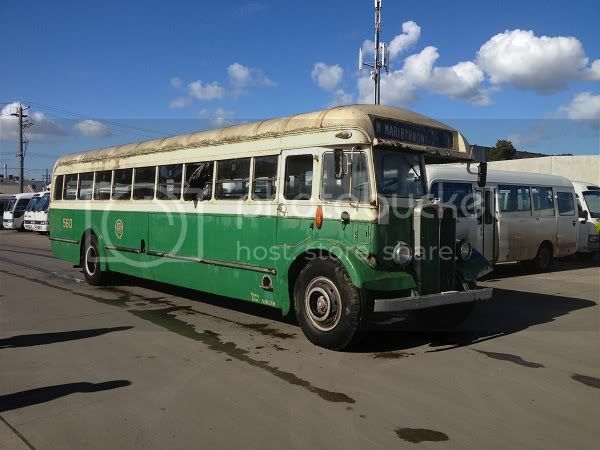 Since its arrival we have completed a comparison of the two buses and determined that AEC 560 will be restored first. This one will be completed and enter DERMPAV heritage service. AEC 531 will now be a subsequent restoration with both ending up running mates for each other. With this succession planning in place and the large stock of spare parts will stand DERMPAV well for continued future heritage bus operations. Here is the group photo of those involved with the recovery of AEC 560 at the Dee Decker Tours depot before departing for Newport L-R: Max De Courcy Cann, Colin Kelly and John Phillips, all are seen pictured with AEC 560. DERMPAV is having discussions with our landlords about erecting a building that will see AEC 531 and AEC 560 housed securely only time will tell how that turns out. But once approved DERMPAV will erect the bus garage, giving some permanency to our heritage bus operations. Already we have removed the steering wheel from AEC 531 for restoration, the pearling on the left hand side of the rim on the steering wheel had cracked and broken away, that which remained was extremely sharp and cut into the hands if they were unprotected when attempting to steer the bus. So we forwarded the steering wheel to Pearlcraft of Bega in New South Wales, who not only have a huge reputation for carrying out quality work, but also carried out this work for the MMTB on the tramway buses when they were all in active service. They were able to provide us an endless amount of advice on correct colours ensuring our restoration is to the highest standard. I believe the photos speak for themselves. If you have a need to have a steering wheel re-pearled, please consider Pearlcraft, you can visit their website at http://www.pearlcraft.com.au I feel the end result will not disappoint you. 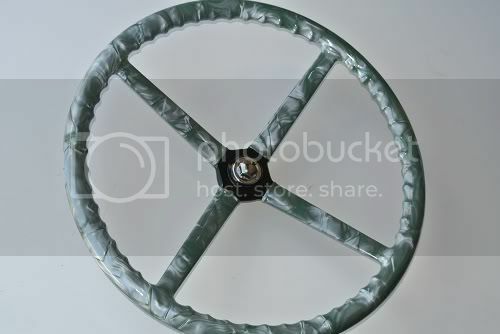 I have posted two photos, the first one shows the steering wheel before being sent away and the next one is of the steering wheel after being returned. Since my last posting, our organisation has become aware that 2012 is the 100th anniversary year of the Associated Equipment Company, we have corresponded with, and are now members of the A.E.C. Society in England who are organising a bus rally to commemorate this event, and as a result of this correspondence we will be dedicating this restoration of AEC 531 and AEC 560 to this milestone. An immediate requirement is to fit a battery isolation switch so the batteries do not have to be removed from the bus each time, also to fit door locks to the drivers cab and the two passenger access doors to secure the bus whilst it is sitting in the DERMPAV compound. In time DERMPAV will erect a garage to house the buses within to ensure they are kept securely, and out of the weather at the DERMPAV depot. Once again I apologise for a long post and thank you for your patience in reading this. 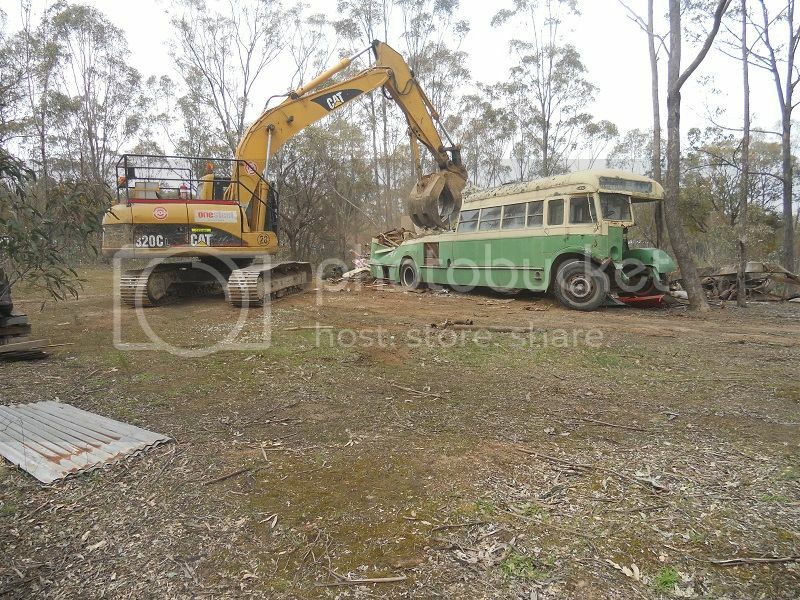 AEC 560 was purchased by Colin Hurst in the late 1970’s from the Melbourne and Metropolitan Tramways Board and was used by him until he passed away, the bus was transferred and then on sold to the previous owner at Dee Decker Tours where it went into storage until we purchased it. AEC 560 was moved under its own power to the DERMPAV depot on the 28th April 2012, it operated over the Vic Roads Network on an unregistered vehicle permit. We were fortunate enough to be able to again call on John Phillip’s services to bring AEC 560 home to our depot. 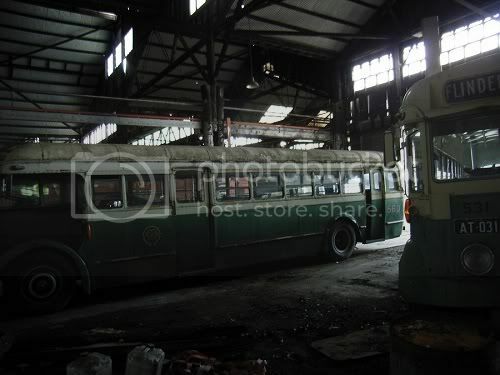 Since its arrival we have completed a comparison of the two buses and determined that AEC 560 will be restored first. This one will be completed and enter DERMPAV heritage service. AEC 531 will now be a subsequent restoration with both ending up running mates for each other. With this succession planning in place and the large stock of spare parts will stand DERMPAV well for continued future heritage bus operations. I believe the photos speak for themselves. If you have a need to have a steering wheel re-pearled, please consider Pearlcraft, you can visit their website at www.pearlcraft.com.au I feel the end result will not disappoint you. 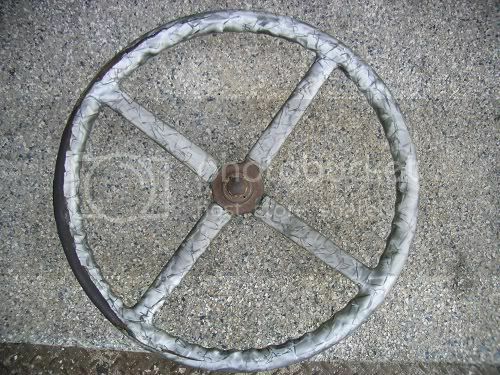 I have posted two photos, the first one shows the steering wheel before being sent away and the next one is of the steering wheel after being returned. Thanks for the update Colin. Gee, that steering wheel looks fantastic. It is exciting to think that, in the not too distant future, we will have not one but two of these great buses back in operation. Well done! Favourite Vehicle: Anything but a MAN! Here I am back again with my third post on DERMPAV’s forays into bus preservation with another update on our progress on our AEC buses. Thanks to all those that have offered their comments and support also to all those that are now following the progress through this forum. I would like to offer my apology for the double post that appears above, I tried unsuccessfully to contact the moderator to have one taken down. I had posted our last post and waited for it to appear, after a while I thought the moderator had not received it and forwarded a second one, then to my dismay both were posted. I guess patience is a virtue, maybe one that I am yet to learn! I will start out by saying that we are only newbies to the bus preservation scene, but I think if you have been following these posts you already know that! We find ourselves on a continued learning curve. As you will already know DERMPAV were thrust into bus preservation, so we approached this mode of transport from a business view point but needed it to have a heavy leaning toward the heritage movement in order that it would fit into our current operations. Fortunately the AEC Regal Mark III’s fitted into the heritage mould quite easily. We were also very mindful of the frustration a slow moving vehicle causes to other road users on a modern road network. So in order not to hinder other road network users excessively and to make the AEC side cabs a more versatile bus for heritage work we decided that the speed should be increased from 60 kph to 100 kph, it is after all only 40 kph more, that shouldn’t cause any problems we thought! Well, how wrong were we! Taking any vehicle beyond its OEM design operating parameters needs proper engineering certification and to this end we involved an accredited Vic Roads engineer, he came on site and viewed the buses, crawled underneath them, took some notes and photos then requested some information on the engines horsepower, braking systems, gearbox and diff ratios. We eventually forwarded him an electronic copy of the maintenance manual for the AEC Regal mark III buses. In time, we were told that we had two options 1. To increase the road speed to 100 kph we would need to spend upward of $150,000.00 to replace the entire drive line of the bus. It involved fitting another more powerful engine, an automatic gearbox, and a new diff along with another front axle. Or 2. We could leave the bus as it currently is and use it within its OEM designed speeds. A heritage organisation walks a very fine line when keeping a heritage vehicle in active heritage tour service. They often are working with vehicles that have been retired from their regular service life due to their growing years, having been replaced with more modern machines. From the time they are withdrawn they commence missing out on fitments that would have been installed on the vehicle if they had remained in active service. It is a very difficult situation that preservation organisations face in keeping a heritage vehicle current to operate over a modern network regardless if it is the rail or a road network, whilst at the same time trying to conserve the original feel and appearance of the historic vehicle. We have faced this dilemma many times with our Diesel Electric Rail Motors, it is a fine balance of preserving the aesthetics whilst complying with current requirements for continued safe operation. At DERMPAV we resolved this issue by assembling a team of volunteers with the correct mix of skills to facilitate the installation of the modification required, they first contemplate how the historic vehicle would have been modified if the vehicle was still in active service then have discussions on how the fitting will occur ensuring that it will pass a roadworthy inspection whilst preserving the overall feel of the vehicle. Once in agreement, they then carry out the fitting. So far this process has seen a myriad of modifications carried out to our rail motors successfully, and we see no reason why this will not be successful when applied to the buses. Although option 1 was cost prohibitive for an organisation such as ours to consider, we felt to carry it out would have crossed that fine line so far it would have destroyed the original appeal that these buses have. So the realisation set in that the AEC buses were useless for the long distance tours in conjunction with our Diesel Electric Rail Motor that our organisation had planned and needed. So our options appeared to be either return AEC 531 to the heritage pool and place AEC 560 into very long term storage for restoration at a much, much, later date, reassess our the way forward with bus preservation, or move out of bus preservation altogether retaining our rail heritage interests. So once again we found ourselves back in the think tank, re-evaluating not only our commitment to bus preservation but also seeking decisions on the best way forward. 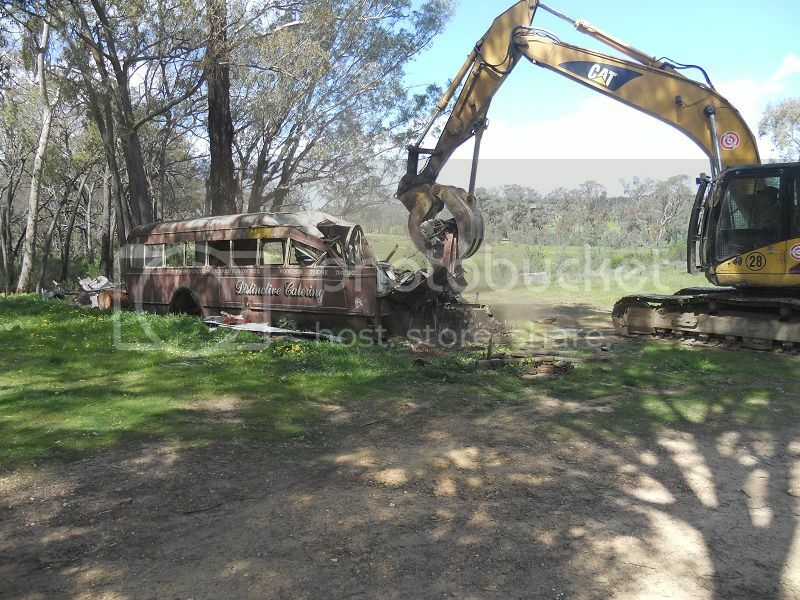 It was identified from the Vic Roads accredited engineers visit that the two AEC’s, 531 and 560 are in really poor shape and both the frame work and the chassis rails will need remedial work. This needs to be quantified to ensure that it is not critical. As both buses are now over the age of thirty five years they require a frame and chassis inspection every five years. We were informed that from the engineers inspection that the frame and the chassis members are repairable, but it must be done under the guidance of an accredited Vic Roads engineer. So at least there was some hope that these buses will see heritage service again. There is no doubt that it will take a lot of work to bring them back to life for re-use on any DERMPAV heritage tour. I guess that in the darkest of clouds there must always be a ray of hope, and the AEC’s have found theirs, in the fact that they were in their day a suburban track bus, this made them very suitable for the stand-alone heritage tours DERMPAV envisaged the AEC’s would operate around the Melbourne CBD. But we were still faced with the problem of how to get to the remote locations required by our tours section to connect with our Diesel Electric Rail Motor thus making other heritage tours more viable. The other issue that was made very clear by the DERMPAV executive committee was the need for the buses to earn their own way. It will not be possible once heritage bus operations commence for them to be supported by our rail tours. As all the income derived from them is used to restore our other Diesel Electric Rail Motors, so in essence the buses had to financially stand alone. In a year they had to earn their annual costs the likes of registration, insurance, maintenance costs, and improvement costs to the asset. It was imperative that we made a sensible decision based on good financial management to ensure that our decision will see the buses continue in active heritage service for many, many more years to come. So with the above in mind, we discussed our options one that was favoured was to dip into the bus heritage fleet and obtain either the B59 Volvo or the Leyland National, these were also ex M&MTB buses that were stored in the bus heritage pool, obviously we knew nothing about them and after some research we found that their seating capacity was restricted to 32 people which rendered them useless for our operations. The other was to directly purchase a second hand bus that was capable of being placed directly into heritage service, it needed to be able to cruise at 100 kph this idea found favour as it would mean putting a fairly modern bus into heritage service. Here is Volvo B59 887 sitting at Newport workshops in the bus heritage pool. In the end the tours section held sway, and after much discussion the final decision was not to purchase or acquire another bus but concentrate on the two AEC’s, press them into the heritage tour service as originally thought. As the Tours section envisaged the stand alone heritage bus tours around the Melbourne CBD as being the main financial income stream for our bus operations. 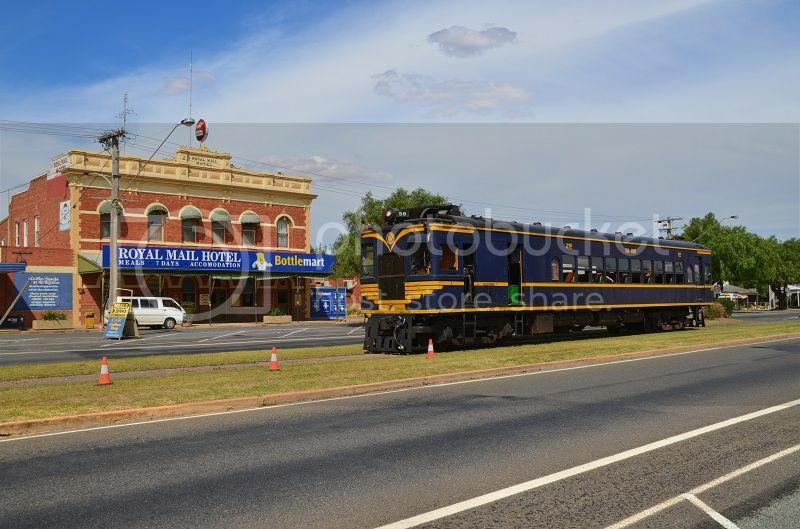 Through discussions it was thought that the AEC’s could probably be sneaked out to Bacchus Marsh travelling the back way to connect with the railmotor at Bacchus Marsh for the run to the Plough Hotel in Myrniong. The tours section thought it would be far more economical to hire a coach in Echuca for the weekenders planned to that location. In that way we are limiting our expenses to the two buses that will be operating once a month and we are not putting any unnecessary financial burden on our bus operations. Then later, if we need to expand, we would have that option. But any decision in relation to expansion will then be underpinned from current experience with the AEC’s and will be based in demand that does exist in relation to our heritage bus operations, not demand that is thought to exist. 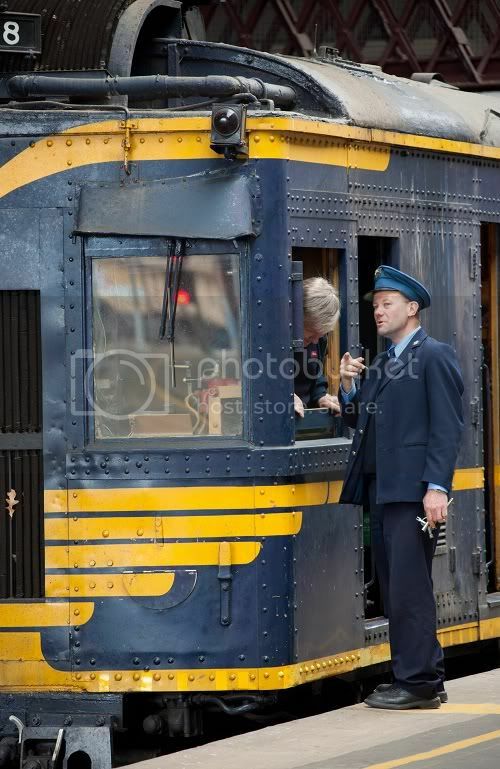 Of course, as has occurred with the rail fan movement, it was felt that probably more bus enthusiasts will come on board once the AEC’s commence in heritage operations. To sustain our bus operations it is envisaged that we will need four bus drivers and four bus secondmen, (Conductors, in bus speak, they just will not be collecting fares from the passengers as all our tickets are presold) but more on this later, we have included a bus secondman for passenger safety in the event of a road incident. Here is AEC 560 is seen sitting under cover with AEC 531 in the DERMPAV compound awaiting its turn at restoration. It is currently envisaged that our heritage bus operations will operate a heritage bus tour around the Melbourne CBD, picking up from the Southern Cross Bus terminal with stop off for morning tea and lunch and delivery back to the Southern Cross bus terminal in the afternoon. We like Southern Cross as it has trains there, and sometimes our railmotor is there. 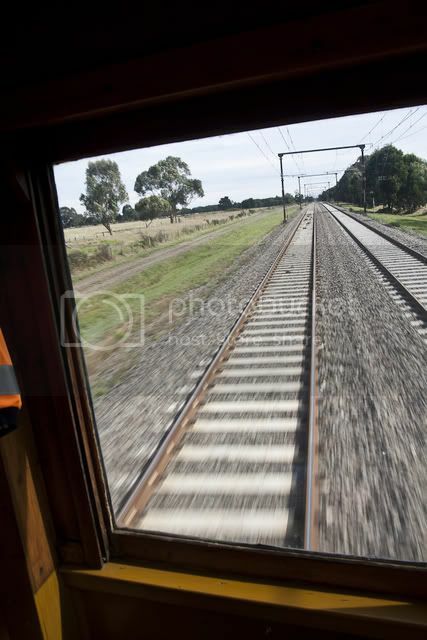 Also every four months if practical, we will connect with the Railmotor at Bacchus Marsh to take our patrons on to the Plough Hotel in Myrniong. 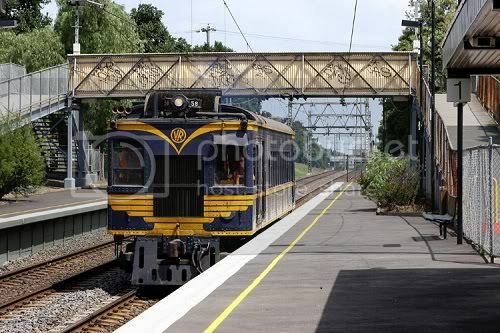 Also there are the Steamrail Open days, these are held every two years and we thought that it would be good to operate a heritage bus connection during the two days that Steamrail showcase their equipment to the general public. 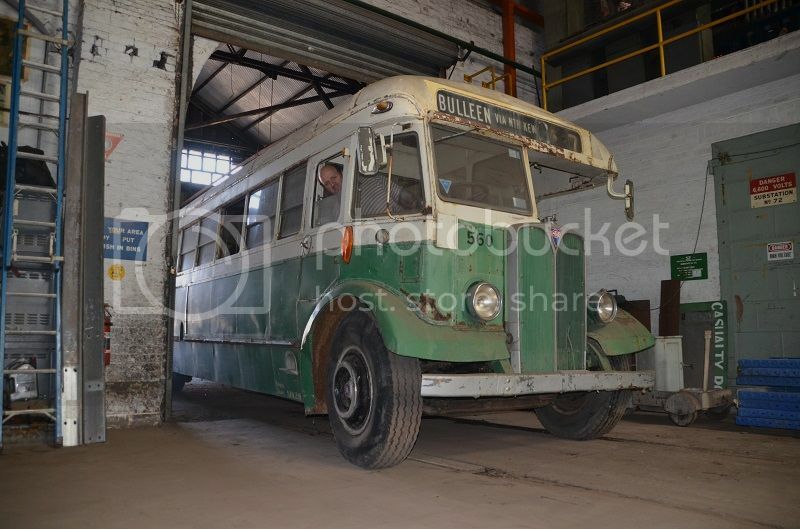 The open days are held at the Railworks depot of the Newport Workshops, the buses would operated a circuit to Nth Williamstown Station and Newport Station returning to the Railworks depot, it is envisaged that entrance tickets to the event will be purchased on board the bus. The next of these open days will occur again in March 2014. 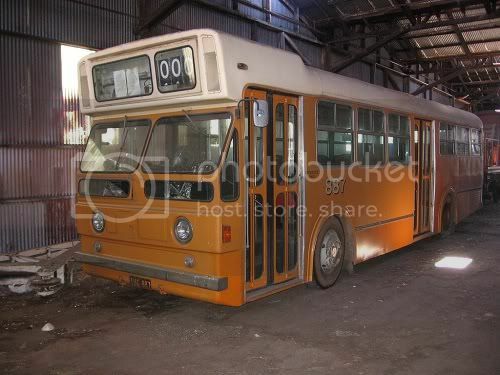 Now that DERMPAV has made a firm decision on the buses future it is time to get into AEC 560’s restoration. So in the next posts we will have some progress to report on the restoration of AEC 560, as DERMPAV moves toward bringing this magnificent bus back into heritage tour service. Of course my post would not be complete without my rail motor photo, we are after all a rail organisation, have I mentioned that we like railmotors! Above we see driver Greg Kisler at the controls of 58 RM passing through Seddon on its test run to West Tower Arrival yards on the 21st February 2012. Thankyou very much for the info and keep the good work up, and its a hard battle against the fun police. Just a quick post, I am not even going to mention that we like railmotors or post a railmotor photo that’s how quick a post this is. We are about to commence the restoration on AEC 560, as part of that process, it will operate over the Vic Roads Network on the 4th August 2012 departing Newport at about 10:30 am heading for the Sita Bus lines Depot in Sunshine Road, where it will be placed on their chassis washer and then onto the Truck wash on the corner of the old Princes Highway and Little Boundary Road for an external body wash, then back to Newport. This post appears for those of you who may want to avail some photo opportunities enroute, if you come out and the situation arises please make yourself known to those DERMPAV members involved with the transfer. Please be mindful that the Sita Bus depot is not in the public domain and we would ask that unless previous permission has been obtained through Sita that you remain off their premises until AEC 560 returns to the public roads network. We thank you for your cooperation in this matter. We look forward to seeing you on the day, it would be good to meet up with those people following this post. If you are intending to come out and meet up, the truck wash at the above location might be the best place as we will be there for a while and will have time for a chat. I extend our apology to anyone that came out on the 4th August to see AEC 560 and meet up with us. We had a few issues at Newport and after they were resolved we headed over to the Sita Bus Depot, after using the automatic section of the bus wash we were generously offered the use of the manual bay and we completed what we would have done at the truck wash on the corner of Little Boundary Road and the old Princes Hwy. I will post three photos the first shows Max De Courcy Cann making some adjustments to the drivers side mirror whilst the radiator is being flushed. William Colliver is sitting in the drivers seat, his father John, was a bus driver at North Fitzroy depot and tram driver at Camberwell depot he moved up through the ranks and into management of the M&MTB before retiring from Elwood depot as depot manager on the 8th February 1991. William is a bus driver with Driver bus lines, so there is a strong connection with AEC 560 in the Colliver family. 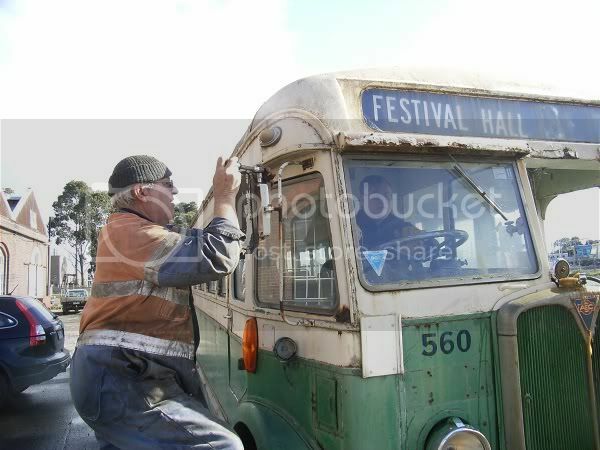 Williams brother Robert has been a life long member of DERMPAV so maybe the buses were a natural extension after all. Here we see Max making some last minute alterations to AEC 560 prior to it heading over to the Sita Bus depot for a wash. Here is a photo after AEC 560's first pass through the automatic section of the bus wash. By comparing it to the photo above you can see how much cleaner it already is. Here is a photo after AEC 560 sitting outside the Nth Williamstown shopping centre, as you can see it looks spotless compared to the other two photos. As was previously posted we operated AEC 560 on an unregistered vehicle permit from the DERMPAV Depot to the Sita Bus Lines depot on the 4th August 2012, it was unfortunate that their chassis washer was not functioning correctly and they kindly made their manual washing bay available for the duration, this negated the need for us to head over to the truck wash as the work that would have occurred at that location was carried out at the Sita bus Depot. DERMPAV extends its sincerest thanks to George Sita and the friendly staff at the Sita Bus lines for the extended use of their facilities. From there it was back to the DERMPAV depot and back into the compound, on the way back it was interesting as AEC 560 came over the bridge spanning the railway at Newport, a chap stepped out from the bus stop and hailed the bus, this caused more than a chuckle by those on board the bus. Here is a You Tube Link that shows video footage of that operation: http://www.youtube.com/watch?v=7XTx6zlQwNs we would like to thank Matt Oaten for covering the day. (Don’t forget to turn on the sound to listen to the throaty note of the AEC diesel engine). 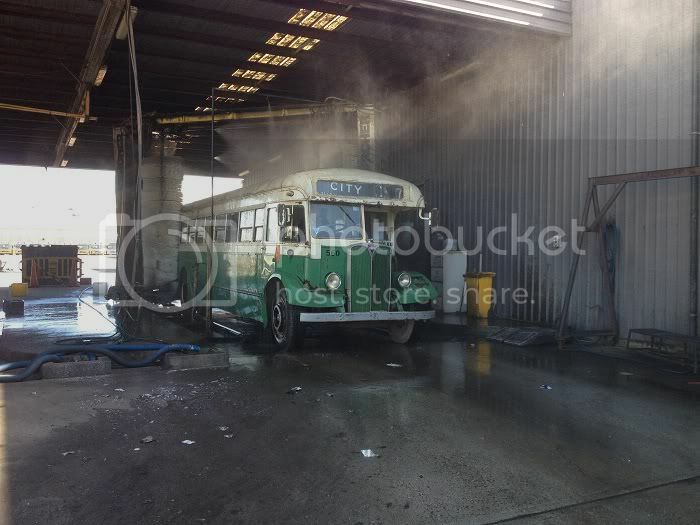 The above photo shows AEC 560 in the Sita bus washing facility. We were again fortunate to avail the services and experience of David Oaten and John Phillips, both of these gentlemen explained the finer points of operating a half cab to William Colliver, one of our members who will be driving our bus in heritage service. We again thank them both for their continued help and support in seeing our buses into DERMPAV heritage operations. Well, DERMPAV took its first tentative steps into bus preservation when it removed the wheel dress rings off AEC 560 and sent them out to the electro platers on the 23rd July 2012 to have all the old paint and chrome work removed. The dress rings were repolished and re-chromed. This signified the commencement of the restoration of AEC 560. Here are the restored dress rings freshly back from the electroplaters. It seems the M&MTB had a fetish for painting every thing that was chromed, silver, It is amazing the amount of bits we are finding painted silver that are chromed underneath, never mind, we do intend to rectify that situation as the restoration progresses! On the 1st September 2012 and the 9th September 2012 we actually made progress on the bus itself, Firstly selected seats were removed being numbered as they were removed, the internal panels that were nominated by the Vic Roads engineer were removed. This will enable the selected sections of the frame to be inspected. In the future we will arrange another inspection. As an aside, we have received a quote for a set of tyres for AEC 560 they are $3120.00 that is fitted and balanced, the old re-treads that the bus is currently sitting on are no longer available and the new tyres are radial tyres, this equates to $520.00 each tyre, so now we are coming to the understanding that bus preservation is at least, not cheap. The current tyres on AEC 560 are reaching the very end of their serviceable life, and we feel lucky that we have gotten the service out of them that we have. AEC 560 has been sitting on these tyres since 1998 that is after all 14 years. For reliability reasons these tyres will simply not be able to continue in heritage service with paying passengers. 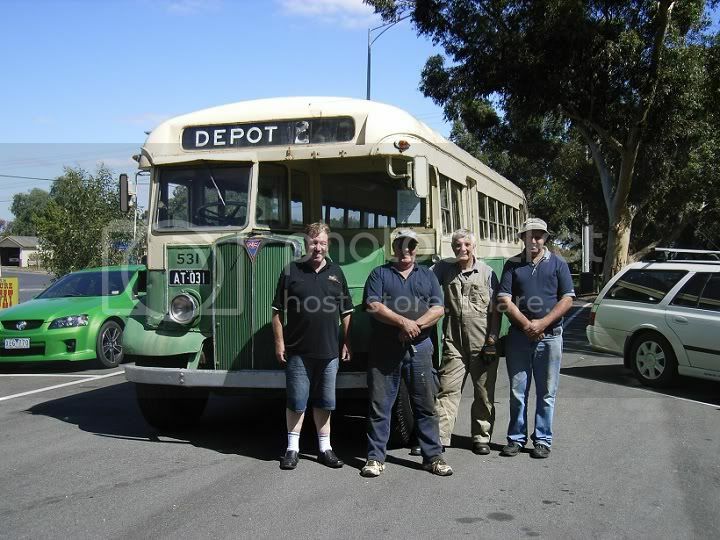 As a point of interest, there is a line of discussion going on within DERMPAV currently with regards to the colour scheme the bus should be returned in, some would like to see it in the early colour scheme with the words MELBOURNE & METROPOLITAN TRAMWAYS BOARD between the two doors, whilst others feel it would be far simpler to return it in the colour scheme it is in currently. As it is only two colours, green and cream. If you have a look at John Phillip’s bus AEC 592, or AEC 352 in the Sydney Bus and Truck Museum that colour scheme does look quite smart, but the older one has more of a heritage feel to it, I know in my first post I stated that we would repaint AEC 531 in its current colour scheme but during a restoration these things are always fluid, so I guess we will have to wait and see how things work out in that regard. 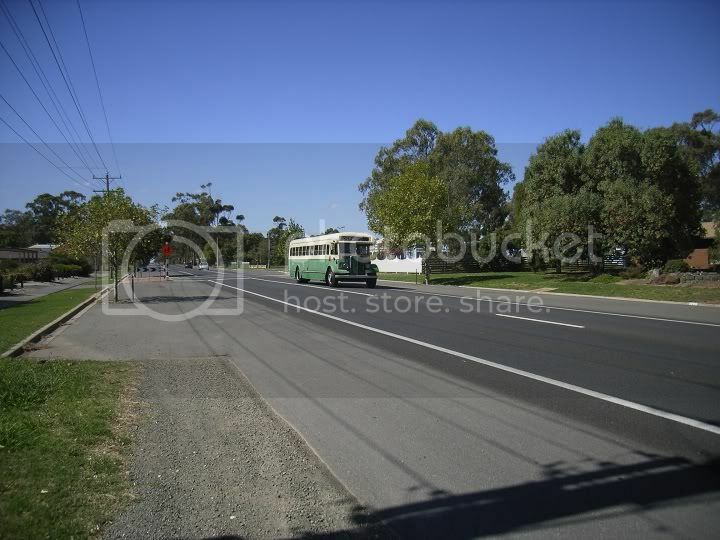 Here are two photos, the first is of AEC 556 the photo was taken in 1956 and it shows the old colour scheme of the bus. The other is of John Phillips bus AEC 592 after its restoration was completed. Both look quite smart, but as always those undertaking the restoration will ultimately make the recommendation to the executive committee for a decision. 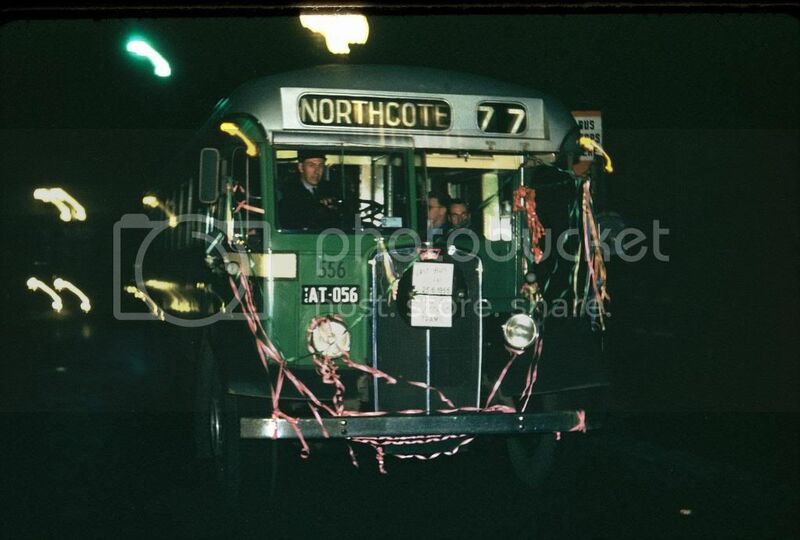 Here is a Photo of AEC 556 on the last service from Northcote it shows the old colour scheme. Here is a photo of AEC 592 after John Phillips completed its restoration, this colour scheme looks clean and quite smart. See you in the next post, with more progress on AEC 560! Love the video! Seeing inside of Newport yard is something I've wanted for years, lots of old vehicles there just sitting around too.. Good to see 560 moving, how would I get involved to help with the restoration? I am back again to report on more progress in the restoration of AEC 560. With all the panels off the selected locations and the frame sections exposed we arranged another visit of the accredited Vic Roads engineer to inspect the requested sections of the exposed frame. 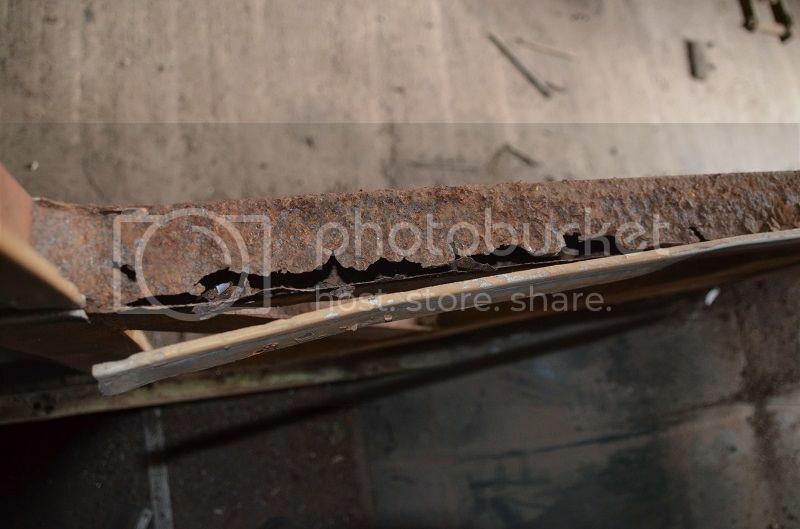 This inspection occurred on the 24th September 2012, some of the exposed sections of the frame showed decay and suggested remedial works were discussed at some length. We were requested to remove other panels above the rear wheel arches to determine the frames structural integrity in these locations. It was apparent that water had been entering the lower sections of the bus. The entry point could easily be identified after the panels were removed. The water had been coming in through the window frames or through the rotted window sills. The window sills were discussed at some length and it was decided that the extent of damage, would only be determined when the windows came out of the bus for reconditioning. 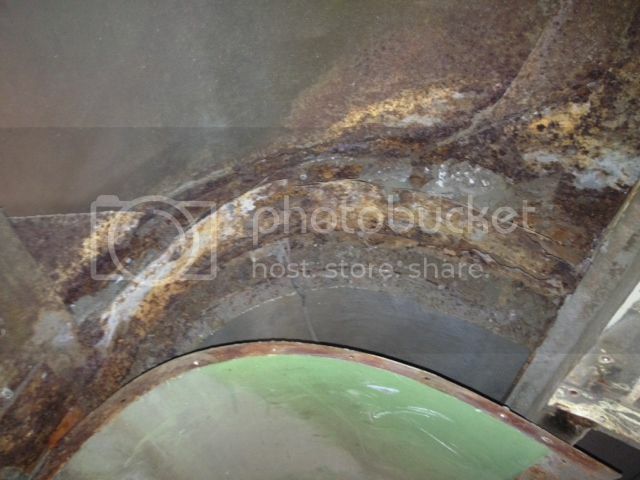 It was agreed, any that had rusted through will need to be removed and the rusted sections repaired. Our method of rust prevention that will be applied to the exposed framework was discussed and this also met with approval. We have organised ourselves a little better in the workshop, so on the working day on the 29th September 2012 the bus team removed all the seats and placed them in storage, this gave free access to all the parts and panels, the panels over the wheel arches were removed to show decay in a vertical and horizontal frame member, although it was determined that the frame had not moved, there was minimal decay in all other areas. After consultation with our accredited Vic roads engineer and discussing in detail the repair method we were given the approval to complete the interior restoration of AEC 560, keeping a photographic record of work done. So now we have some clear direction, it is full steam ahead. 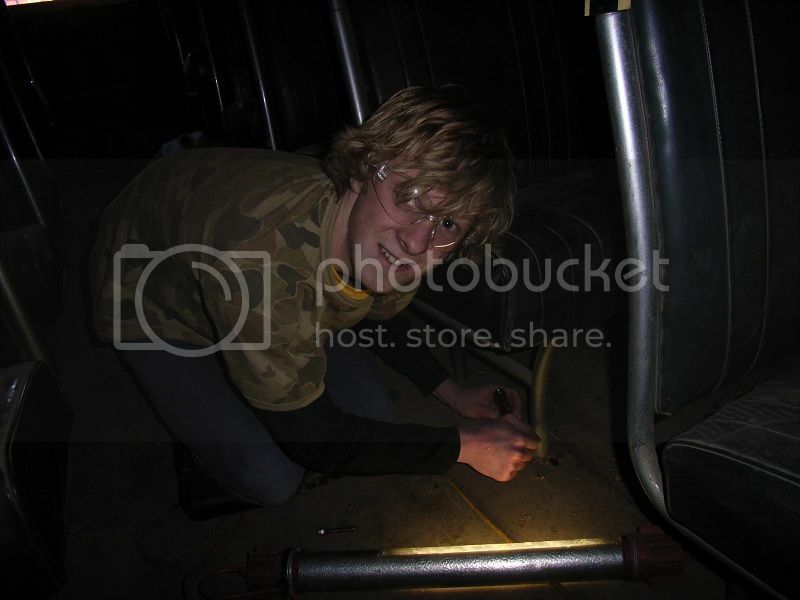 Above: One of the bus restoration crew, Cameron Stewart removes the seat retaining bolts from AEC 560’s seats to facilitate their removal. As we move toward completing the interior, we have decided to renew the wood work below the belt rail as most of it is either faded from extended exposure to the sunlight or it is water damaged from the window seals being compromised and the bus being out in the open for many years. With the seats out it will give the crew that are refurbishing the components that come off the bus the opportunity to send the seat frames out to be re-chromed. The bell cord has become brittle and snapped in about 8 places, luckily Gary Davey had a spare and donated it (Thanks Gary). This bell cord, has been stored dry and is in the same brittle condition, so it is now sitting in some leather reconditioner to hopefully see it become pliable again so it can be reused. We think the leather cord is far more authentic than the plastic wire coated cords used later on in service. Above: Here is a photo showing the rear corner section of the frame showing the decay, this section will need to be replaced and the hole in the roof will need to be repaired that was letting the water in. Above: Here is a photo of the framework directly over the offside rear wheel arch as can be seen a large amount of decay is evident, thus requiring the frame sections replacement. Well that is it from me for now, so I will see you in the next post, with more progress on AEC 560! DERMPAV would like to extend its sincerest best wishes to you and your family, for the coming festive season. We hope you enjoy a merry Christmas and a happy New Year for 2013. Stay safe and we will see you again in later posts as we bring AEC 560 back into heritage service. 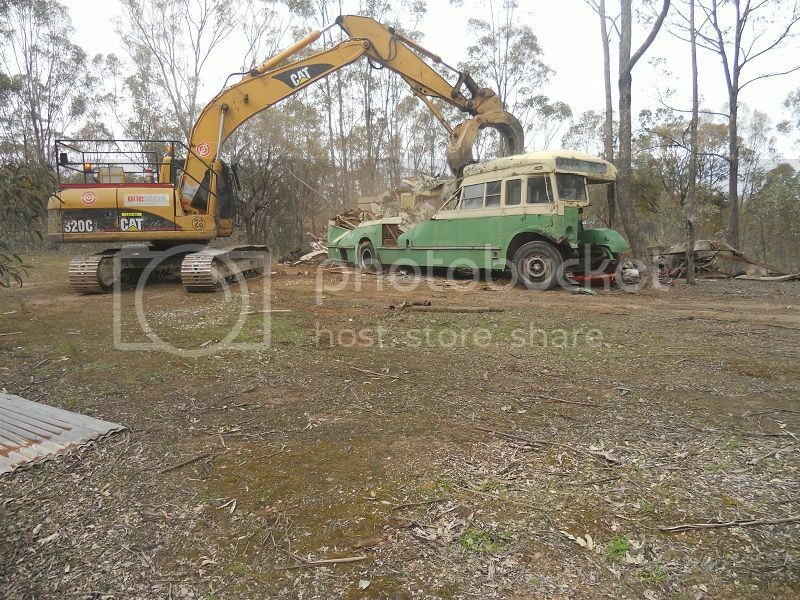 I also found and old Leyland bus its in my friends farm its ex melboune 396 it was green with a silver roof and still looks to be complete its a half cab SD not sure how old it is or if any are still about, but I must get some pics one day. 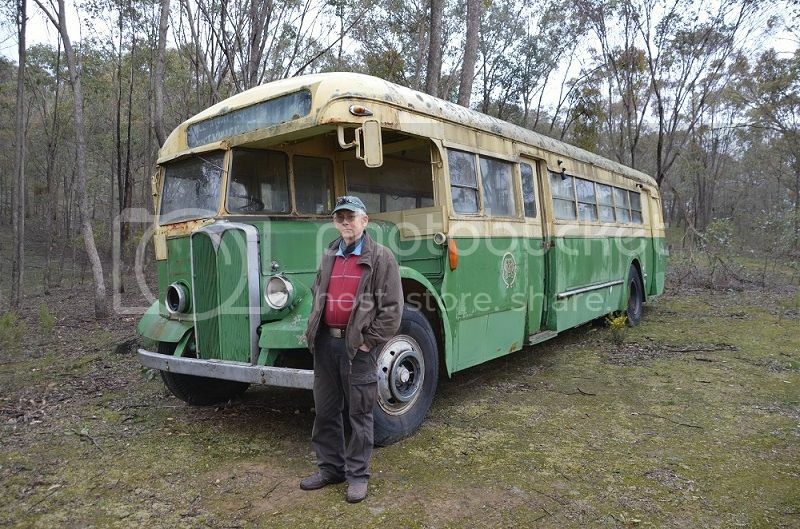 Great Photo Dr Arther Gunzel, there must be heaps of old tramway buses laying around. We were coming back from Camperdown after recovering two, World War 2, 6:71 general Motors Diesel engines for our rail motors. 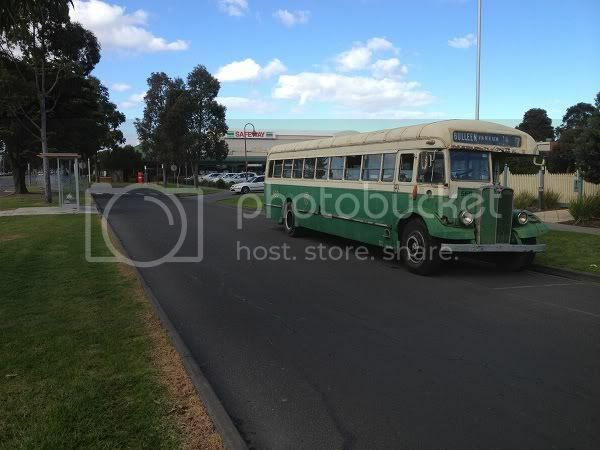 As we are passing through Colac, there parked in a yard is a cream and green bus, unmistakenly M&MTB livery. Unfortunately did not have time to stop as we were a little behind time, maybe someone knows more about it. There was another 41 seat, two door, AEC Regal mark III at the 100th Lake Goldsmith Steam Rally it was painted orange with a bull bar. 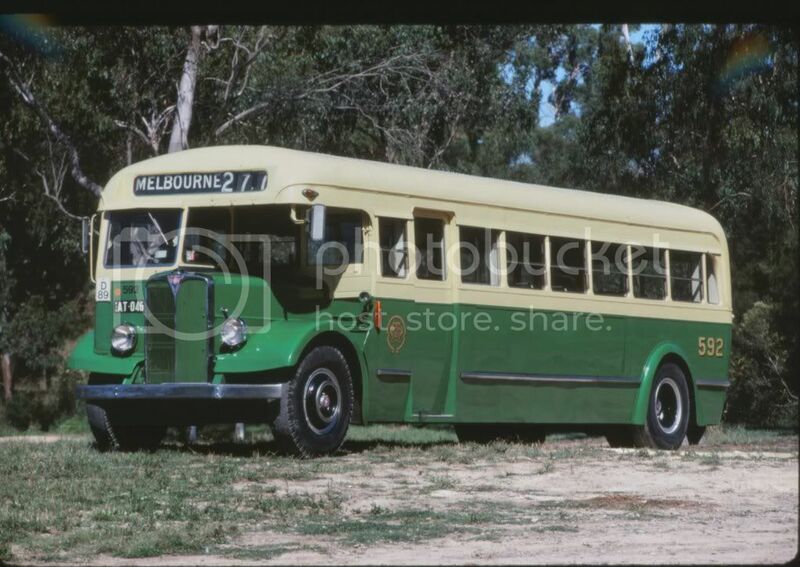 Then there was the one in Cape Tribulation in Far North Queensland (photos were posted on another thread in Bus Australia) it was free to a good home, it also was a 41 seat two door variant. It would be interesting to start another thread with us all taking photos of other AEC Regal Mark III's as we see them and posting them there. Once again many thanks for sharing your photo of the old leyland and a great find. I think the 6:71 was a 2 stroke also used in the NSW CPHs as I have worked on these before have a 4 valve per cyl or 2 valve per cyl heads, this motor was also made in australia,used in some boats,trucks and army gear, and may have being as 2;71 to V,12;71 as GM just added cyl or less, and parts are still about and engines as I can remember getting new linners and pistions for a CPH. I am back again to report on the restoration progress of AEC 560 since my last post. Sorry it has been so long between posts, hope everyone had a good Christmas and is having an exceptional new year. Progress has been happening at a rapid clip, since my last post the team that are supporting the restoration team have matched the interior paints and sourced sufficient to complete the repainting of the interior. 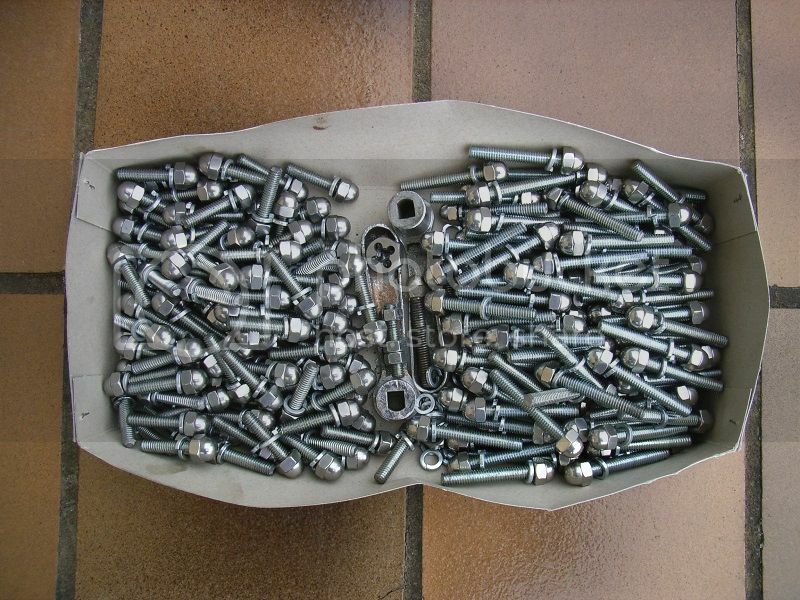 They have constructed 120 seat retaining bolts, these secure the seats to the floor and have polished stainless steel dome nuts on them to finish them off. They have also constructed 110 grab rail supporting bolts, these look the same as the seat bolts but are a little shorter in length. We have taken the opportunity to construct sufficient parts to restore three buses; this will give us sufficient spares for AEC 531 and also leave a complete set as spares for both buses as replacements when both buses are in heritage service. It was unfortunate but the original grab rail bolts were breaking off in the roof, which necessitated the removal of the roof panels to facilitate drilling out the studs and reforming the threaded sections. While the roof panels were down the opportunity will be taken to rub them back and repaint them. Above: Heads on them like mice! Here are all the brand new seat retaining bolts (right) and the grab rail support bracket bolts (left) ready to be packed to sit at Newport awaiting fitting to AEC 560. The new dome nuts are polished stainless steel instead of being chromed steel, now a wipe over with a rag and they will look like new again. The old internal Masonite panelling from below the belt rail was removed as water had been absorbed causing the old panel work to buckle, as a result new panelling will be sourced. Once it is ready to go back on it will be undercoated and will receive its top coats. 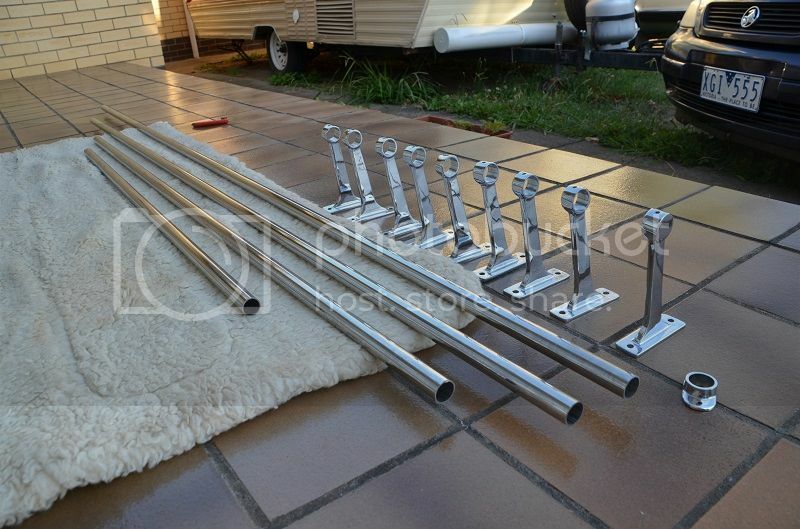 The polished stainless steel grab rails were procured, and the electroplaters have completed the refurbishment of the grab rail supporting brackets, these all look magnificent. Above: All the components that make up the off side grab rail. We are a lazy lot at DERMPAV, we believe in less work and more enjoyment playing with our toys, and toys don’t get much bigger than an AEC side cab bus. We decided to replace the chromed steel grab rails with polished stainless steel ones, as in service all they need is a wipe over with a damp cloth to make them look like new again. Easy maintenance…We like that! 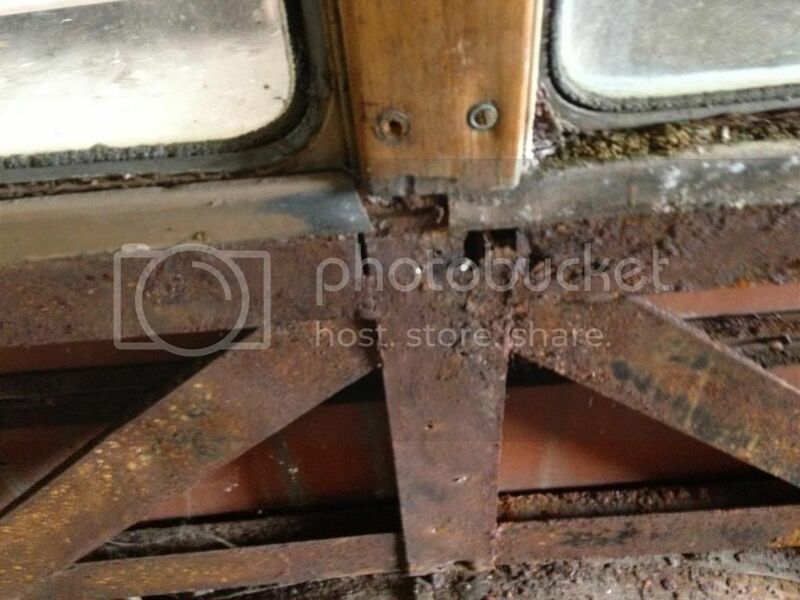 As often occurs in any type of restoration, you sometimes appear to take five steps forward to discover that you really have not made much progress, as you then need to take four steps back, this became true as the main bus frame was exposed. The buses frame has turned out to be like an onion, the more layers you expose the worst it seems to be, and it really is enough to make you cry. 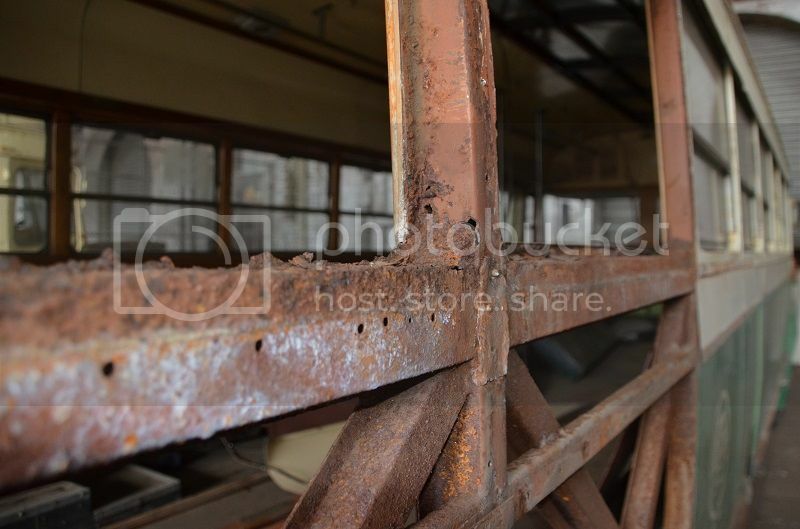 After removing the two window frames, then removing the window sills off the frame above the off side rear wheel arch, we exposed the frame work on both sides, this gave us a first hand look at the extent of the rust decay. 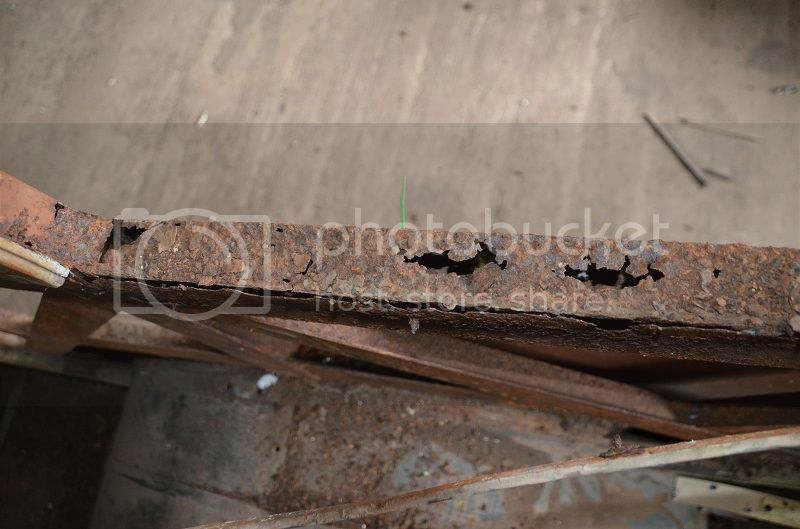 At first it did not look to bad until we hit the frame section with a ball peen hammer, this dislodged all the rust in the top rail of the longitudinal frame section and immediately revealed the large amounts (extremely large amounts) of decay. We realised that the entire side of the bus will need to be examined with the external panels as well as the internal panels being removed. After the necessary repairs are undertaken the frame will be rubbed back and treated with our rust preventative treatment then the internal and external panels replaced. Our thought process now is to commence in one place and expose the frame, carry out the necessary repairs and move around the bus replacing the internal and external panels as the frame is repaired and placed back in good order. We anticipate moving slowly around the bus. I must point out that this is now become an expensive, slow and tedious process. But it must be done correctly otherwise trouble will raise itself later when the bus is in heritage service. Here is a some photos of the exposed longitudinal cross members above the off side rear wheel arch showing the large holes in the top rail of the framework, this is where the window sills and windows sit as can be seen they need replacement. They are included so I can clearly show why it will take a while for us to complete the restoration. Above: Here is a photo of the exposed section of AEC 560. the number 560 is located at the rear of the bus. Above: Here is a close up of the rear frame member focusing on the upright looking toward the front of AEC 560. Above: This is the forward window frame looking down on the section where the window would sit. The decay is obvious. Above: Here is the next window frame moving toward the rear of AEC 560, Yes it is in a bad way! With all this work in front of us, our main focus now is to move AEC 560 inside our workshop in 9 road. To make space inside 9 road we need to move equipment and stock holdings to the location the bus currently occupies and this will take a few months to achieve. Once completed, it will prevent transient people inspecting our work and having a sticky beak when we are not in attendance. It will also provide a greater level of security enabling the restoration team the ability to leave tools and equipment in the bus instead of having to pack them up at the end of each work session. It will also enable the complete removal of all the window frames on the off side. The passenger saloon windows are a complex piece of work, they are in an advance stage of decay, all the rubber sections have perished. These will be sent out for restoration, but first we need to source a location to re-electroplate the frames and to source the new rubber sections that will enable us to reseal the window glass in the window frames as they are reassembled. It will now be a long time before AEC 560 returns to heritage service, a lot longer than we first thought, but at least it will be an asset once this occurs. My posts will probably become a little more distant but never fear I will return, as will AEC 560. If you have any questions between my posts please post them here and I will try and answer them to the best of my ability. 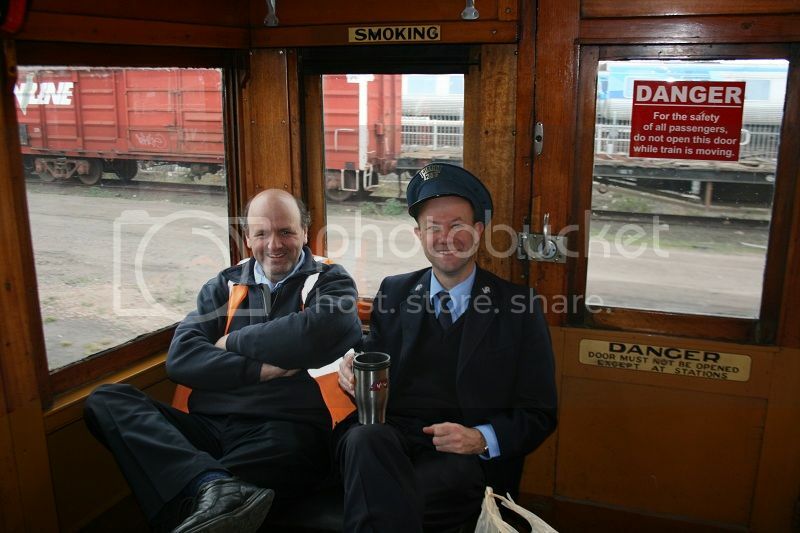 As always, my post would not be complete without a rail motor photo, (we like railmotors!) so this time I have decided to include a photo of 58 RM pictured with the first two V/Line instructors Alan Moriarty and Greg Kisler at the DERMPAV depot prior to departure to the West Tower arrival yards on the 21.2.2011. Well that is it from me; I will see you in the next post, with more progress on AEC 560! We are still progressing with the restoration of AEC 560 and have reached a point where we need to have constructed some new bases for the curved front and rear clearance lights, the front ones have an amber lens and the rear have red lenses. These bases seem to rust out quickly as the ones we have viewed are severly rusted, we were fortuante to acquire a good one off Gary Davey...Thanks Gary! We have taken this base out to our metal working firm who are prepared to manufacture new stainless steel bases for these lamps, if there is anyone else restoring one of these buses and requires some of these bases could you please send me a PM advising your interest and how many you would want, at the moment our metal working firm has indicated that it will cost about $80.00 per base, this is without the lamp fitting. Please see the photo below, it is the component parts of the clearance light, the base is on the left, the lens centre, and the cover plate right. As you can see, it already has a rust hole in it, and the match sticks are being used to make it work as the springs had collapsed under the contact plate. Look forward to hearing from anyone who may be seriously interested in acquiring some bases. I know a lot of you are probably thinking it is about time, but this restoration business, really is a time consuming process. In most instances our progress feels like we have been taking four steps forward to take three steps back, while lots has been done in the past year not much of it has actually been on the bus, most of it has been on systems that will support the restoration and operation of our buses in heritage service. All this has taken some time. To enable AEC 560 to be moved inside our workshop we needed to erect a compound fence around the area where our buses were sitting. This enabled us to bring out DERMPAV’s belongings and store them securely in a reasonably safe area. This took us a lot longer than we expected, when it finally occurred the area vacated inside the shed was then occupied by AEC 560. Well! At last AEC 560 is inside our depot! Both the restoration team and its supporting team have moved into high gear, we are entering the business end of AEC 560’s restoration. Above: Over the working day of DERMPAV on the 6.7.2013 the members worked tirelessly to erect the fencing material purchased off EBay to complete a secure compound area. 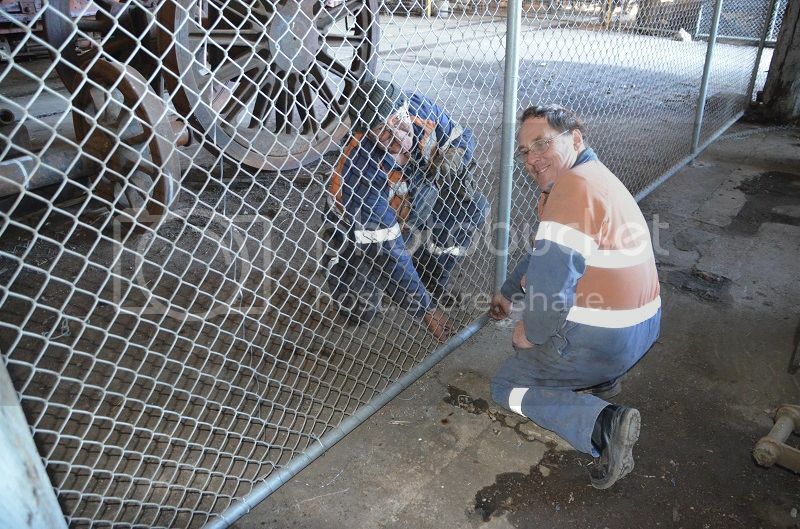 The above photo shows Max De Courcy Cann and Jim Flannery as they complete tying off of the fencing material which secured more undercover area of our depot. Whilst waiting for the bus to be moved inside, the bus restoration team have drilled out all the grab rail bolts that had broken off in the roof sections and also completed the same task to the broken seat retaining bolts. Then with the aid of a tap they have reformed all the threaded sections. Each of the re-threaded areas have been treated with Loctite 767 anti seize compound to ensure the threads remain operational and assist removal in the future. Also the chromed steel side bump strips were removed and passed onto the support crew for restoration assessment. 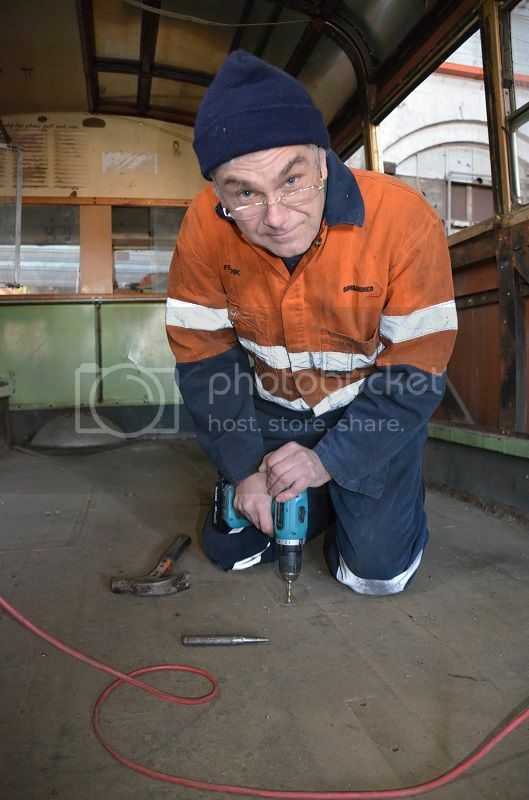 Above: Frank Gherghetta from the bus restoration team breaks his concentration to pose for the photo whilst carefully drilling out the tapping hole in a floor seat retaining bolt. After completing this task he will, using a tap, reform the threaded section in the floor retaining plate of the bus to accept the seat retaining bolts then treat the threaded section with Loctite anti seize compound. Above: A difficult job made to look easy! 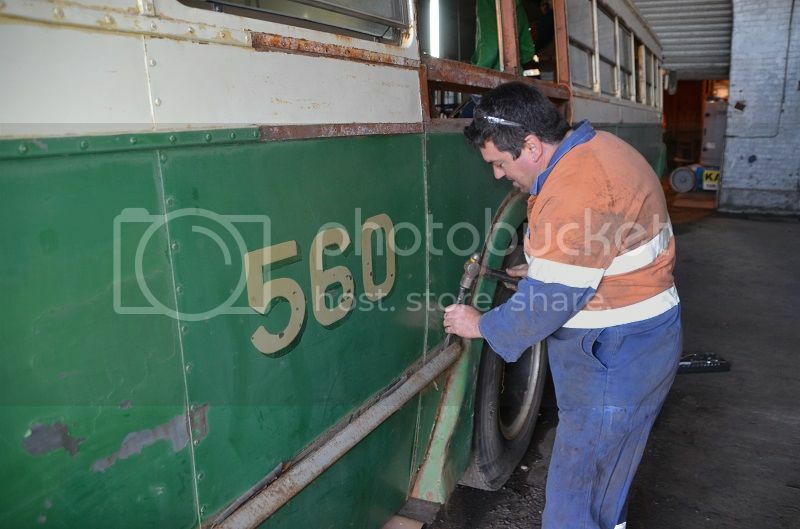 Here we see Jason Oliver of the bus restoration team doing battle with the securing bolts on the dress strips, it was not long before they had succumbed and the dress strips were off the bus for restoration. We would have had AEC 560 inside the workshop probably three months earlier, however, in preservation, when an opportunity presents itself you need to act, and act we did! We had been put in contact with Bob Murphy, over time he had a collected quite a few buses, mostly Regal Mark III’s. At the time we visited Bob he owned two ex-tramway Regal Mark III buses and had a huge pile of spare parts for these buses, we were fortunate to negotiate a deal that saw us acquire quite a few parts for storage at the DERMPAV depot for future use on AEC 531 and 560. 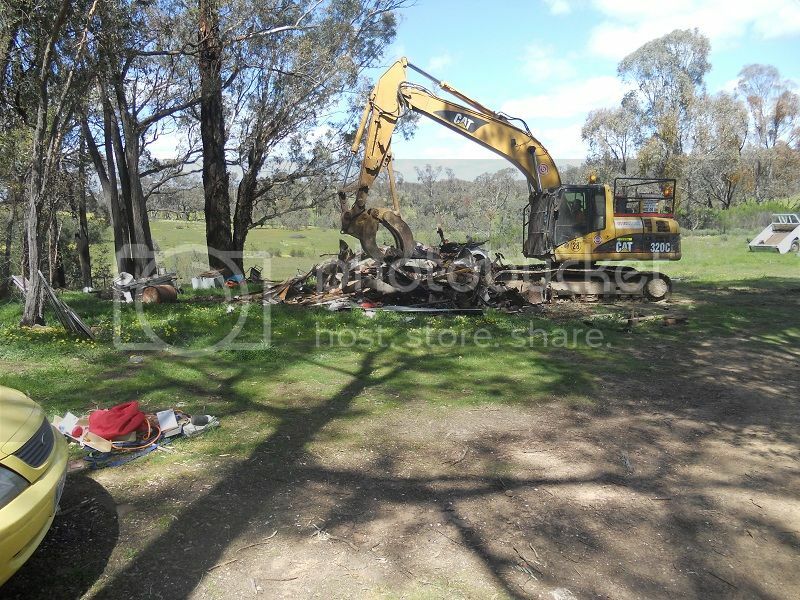 We travelled to his property on the 31.8.2013 and spent the best part of the day there, we eventually bid Bob farewell having completely filled two 6x4 trailers, three utes and a tandem trailer with the boots of the cars brimming with smaller objects. 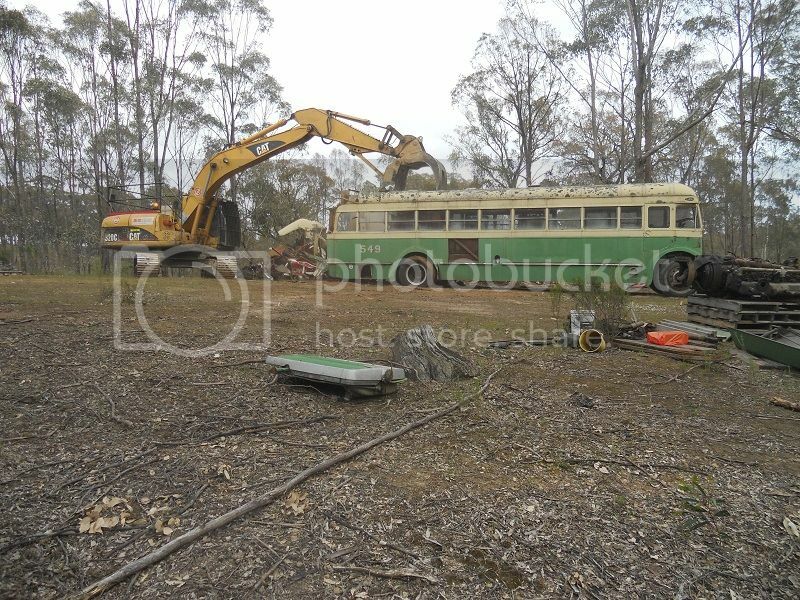 The two buses mentioned above were AEC 549 and AEC 581, unfortunately by the time you read this, both AEC 549 & 581 will have been reduced to scrap metal as Bob needed to clean up his property in preparation for its sale and his bus collection had to go. We have been lead to believe that the Sydney Bus and Truck Museum also acquired some equipment off Bob so all was not lost. 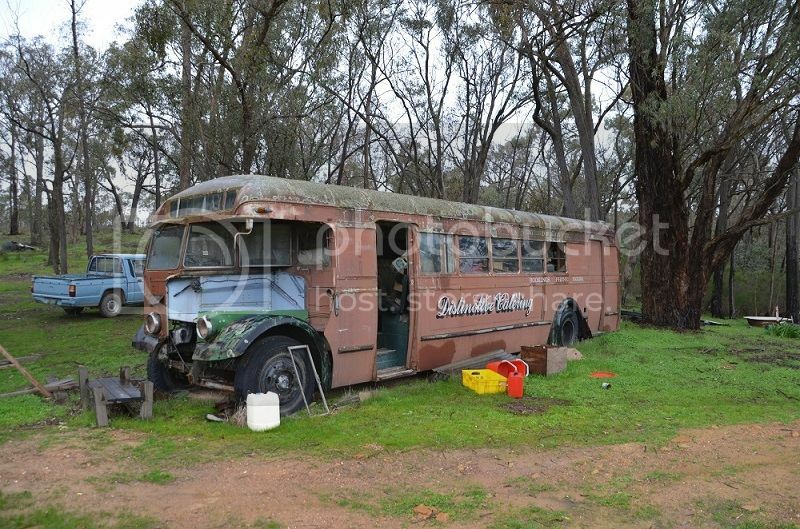 I have included two photos of these buses at the time of our first visit to Bob’s property. 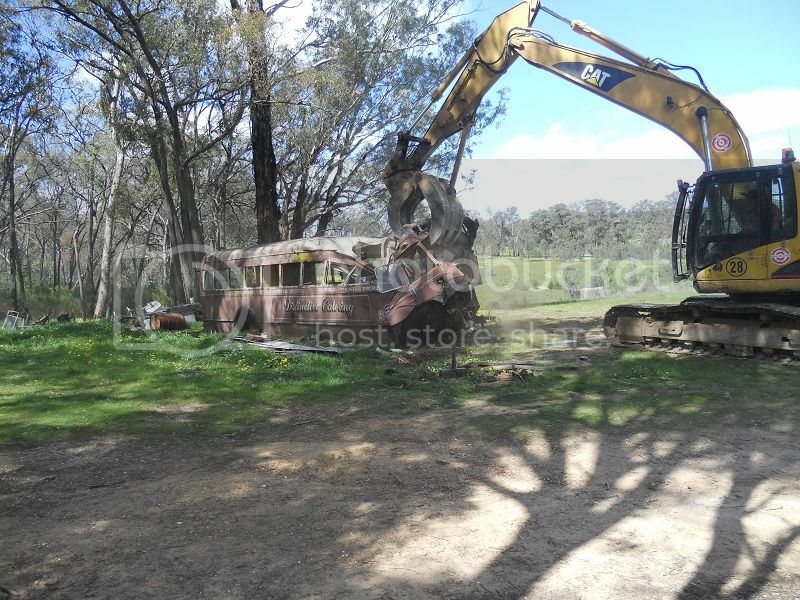 Above: Although looking worst for wear AEC 581 sits on Bob’s property having surrendered a lot of its parts to other operational buses he had in order to keep them on the road. AEC 581 was before its retirement with the M&MTB an ambulance bus. Above: Here is Bob Murphy standing in front of AEC 549 it had been converted into a motor home and used for that purpose, although for quite some time it has sat unused in the bush on Bob’s property. Above: Kindly, Bob offered us the main springs off AEC 581 to replace those on AEC 560. AEC 581 being an ambulance bus was overhauled and did little mileage thereafter for that reason its main springs are in excellent order. Here we see the excavator rolling AEC 581 onto its side. It is the end of the line for this bus. Up until this day (8.10.2013) it was our understanding that all four ambulance buses had remained intact. 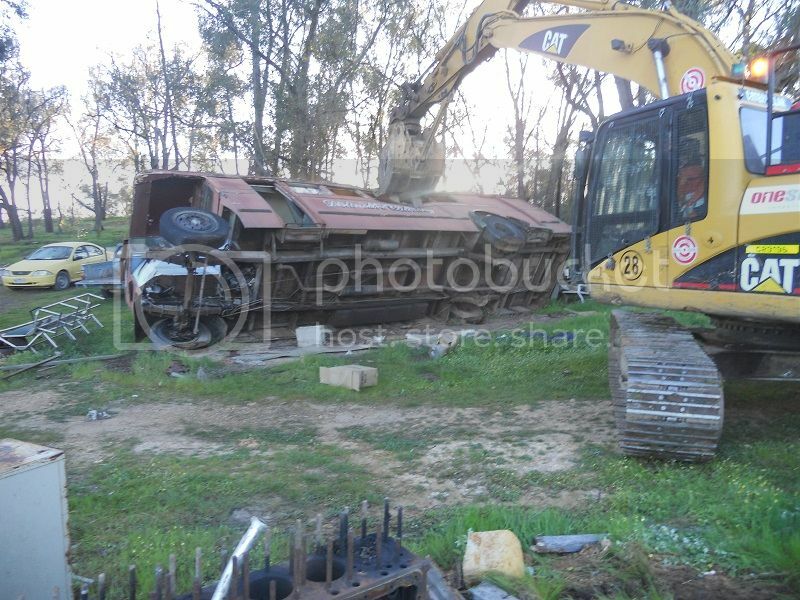 Sadly, here are a series of photos showing the reduction of both buses to scrap metal. So finally, with all the other distractions out of the way we moved AEC 560 under its own power into 9 Road on the 23/11/2013. It was positioned inside the DERMPAV main shed in its restoration bay. Above: With Colin Kelly at the controls, AEC 560 moves inside the DERMPAV depot to take up a position for its continued restoration, here we see it coming through the back door of the DERMPAV depot. Since its arrival at DERMPAV it has lived just on the other side of the door it is coming through in the photo above. Our bus support crew have anticipated the removal of the window frames and have coordinated their restoration. They have settled on an electroplater to carry out the restoration works to the window frames. They have also located a rubber supplier that could supply brand new rubber sections, these new sections are constructed of special rubber which includes a U.V. protection polymer mixed into the rubber compound when the rubber seal was formed, it is far better and will survive much longer than the natural rubber seals that were used by the M&MTB previously. Sufficient quantities have been procured to restore all of AEC 560’s window frames. The bus restoration support crew will remove the glass, clean it, and determine if the existing glass is serviceable, if it is not, then they will organise new replacement glass. 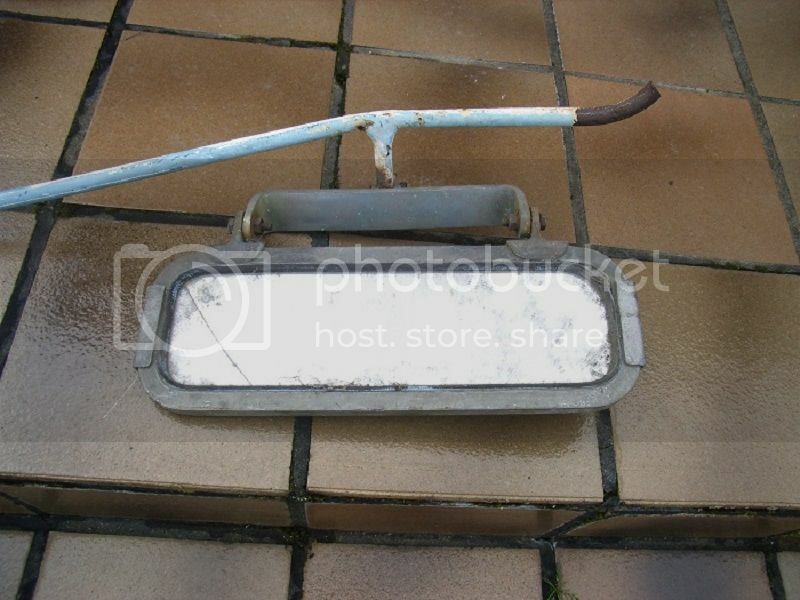 They will also remove all the existing perished window rubber sections out of the window frames and remove the window catch mechanisms cleaning them and storing them for reinstallation. The window frames will then be delivered to the electroplaters who will re-chrome the frames, once completed they will be delivered back and be reassembled using the new rubber sections, once completed they will be stored for reinstallation back into AEC 560. As an appetiser to the saloon windows the bus restoration support crew have completed the restoration of the rear vision mirrors. AEC 560 has three. Two provide the drivers vision down the off side and near side of the bus, whilst the other one in the cab permits the driver to view into the passenger saloon, all have been removed and restored and will be put back on as the restoration nears completion. As we proceed through the restoration, we are making improvements to make the bus more serviceable or practical, an instance of this was the inclusion of a polished section, it has a decorative knob fitted to the bottom of the mirror that looks into the passenger saloon. This was done to prevent the driver’s fingernails from scratching off the mirror surface on the rear where it is unprotected, as was the case on the old mirror. The two photos below graphically show what can be achieved with a little dedication and perseverance; they are a good comparison of what we had and what we turned it into. 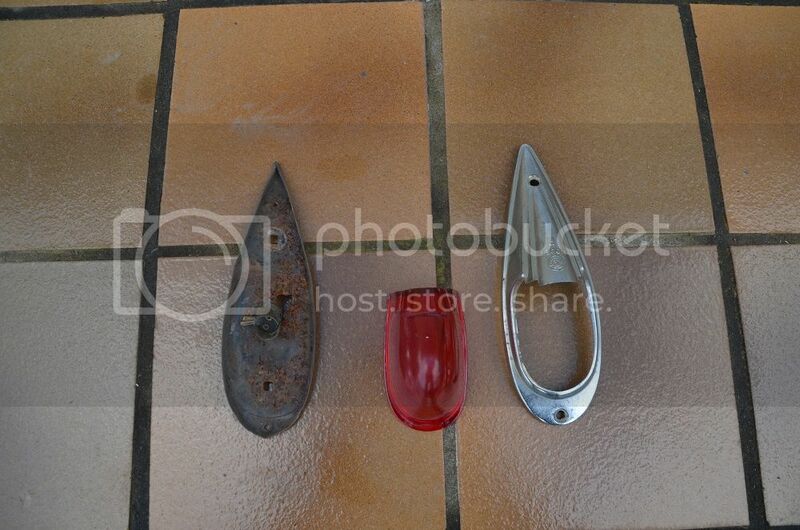 Above: As a comparison to the photo below here is a photo of one of the side mirrors before the restoration commenced. As can be seen the difference is startling. Above: The restored mirrors are at the bottom row. 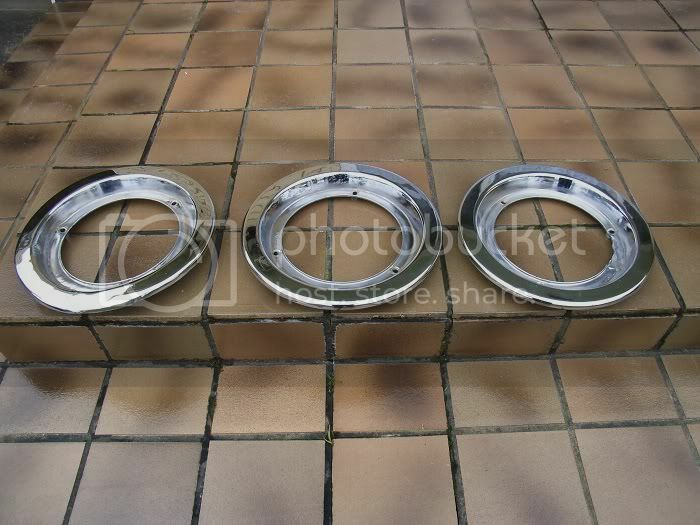 The far left mirror is the drivers mirror that looks into the saloon, the decorative knob is clearly visible, the off and near side mirrors are next, then two spare mirror blanks are shown, one side showing the protective sheet that faces forward to protect the mirror coating. During the restoration of the mirrors the opportunity was taken to completely seal between the mirrors protective panel and the mirror itself with Sika flex, this was to ensure that water could not sit between the protective strip and the mirror glass, staining the reflective surface of the mirror. 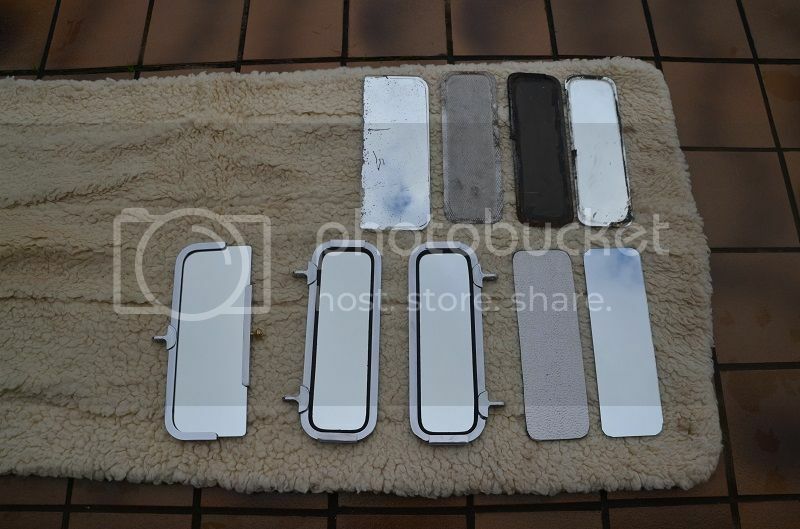 The above row shows some of the old mirrors that were removed from the old mirror frames, as you can see the old mirror that looks back into the passenger saloon is badly scratched, whilst the side mirrors are badly stained and spotted. The three restored mirrors are now awaiting storage at Newport for fitting to AEC 560. My post would not be complete without a rail motor photo, (we like railmotors!) so this time I have decided to include a photo of 58 RM in the main street of Wycheproof, here it is seen stopped outside the Royal Mail Hotel whilst heading toward Sea Lake during the Sea Lake Overnight Tour 9.3.2013. In closing this post down for 2013, I would like on behalf of the DERMPAV executive committee to extend all the very best to yourself and your families for the coming festive season. We hope that you have a Merry Christmas and a safe and happy New Year. Fantastic report Colin and the progress on 560 is great to see. Congratulations to your bus restoration team. Following this thread with interest. I hope I get a chance to see the restored product some day. I am a member of the public and I guess I am a moron, although I try very hard not to be.